Most ham radio contacts on the VHF and UHF bands are made with repeaters. Repeaters are most useful for local and regional communication, allowing individual hams to use low-power handheld or mobile radios to make contacts over that same wide area. For this scheme to work, the repeater input and output frequencies are fixed and well known, so the bands are organized into sets of channels. Except for some at the upper end of the 10 meter band, repeaters aren’t used on the HF bands because of the need to receive and transmit simultaneously — difficult within single HF bands. Most VHF and UHF voice contacts use the FM mode of voice transmission because of its excellent noise suppression, making for comfortable listening. The drawback is that FM doesn’t have the range of CW or SSB transmissions. Contacts made directly between hams via FM are referred to as simplex, and those made via a repeater are duplex. Repeater and simplex FM channels are generally separated by 15 or 20 kHz. You can view a complete band plan for the 2 meter and 70 cm bands at ARRL. Repeaters enable you to use low-power and mobile radios to communicate over a large distance. Many hams use repeaters as kinds of intercoms to keep in touch with friends and family members as they go about their daily business. These contacts generally are much less formal than those on HF, and you’re likely to hear contacts among the same groups of hams every day. Repeaters are where you find local hams and find out about local events. To make contact via a repeater, you may have to enable tone access on your radio. Tone access adds one of several standard low-frequency tones to your speech audio to let the repeater know that your signal is intended for it and isn’t interference. Not all repeater channels have an active repeater. To find repeaters in your area or while traveling, check a repeater directory or website. Some of these directories are nationwide, such as the ARRL Repeater Directory, available as a book or on the TravelPlus CD-ROM; others focus on specific regions, such as the New England Repeater Directory. RF Finder is a smartphone app that accesses a worldwide directory on a subscription basis. The directories list the frequencies and locations of repeaters so you can tell which ones may be available in your area. Repeater directories also list the required access tones and the other operating information and features for individual repeaters. 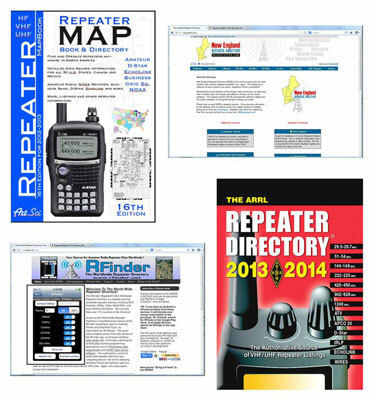 Use a repeater directory or website to find a repeater in your area. Determine the repeater’s input and output frequencies. Set up your radio to listen on the repeater’s output frequency. You can also listen to stations transmitting to the repeater — an act called listening on the input. Tune your radio as you do for FM signals. Some VHF/UHF radios have an “auto repeater” feature that can tell when you are tuned to the repeater channels and automatically set up the radio to transmit and receive on the different frequencies required. For direct ham-to-ham contacts on VHF and UHF over distances at which FM results in noisy, unpleasant contacts, use the more efficient CW and SSB modes. This method is called weak-signal communication on VHF and UHF because you can make contacts with much lower signal levels than you can by using FM. The lowest segments of the VHF and UHF bands are set aside for weak-signal operation. Weak-signal operations are conducted in much the same way as SSB and CW operations on HF, with contacts taking place on semirandom frequencies centered on calling frequencies.